CHT provides a world leading sea freight service to countries with no direct air service. 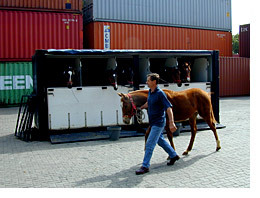 One of the world’s most experienced horse carriers by sea, CHT has custom built containers ensuring the ultimate in safety and comfort for your horse. All shipments are accompanied by both a groom and a veterinarian – both of whom are highly experienced in all aspects of sea travel. They also carry a complete range of supplies to ensure maximum comfort and health for your horse – from reserves of fodder to a full range of vetinary supplies. With its many years of experience, CHT has developed excellent working relationships with Port Authorities. As testament to our efficiency and professionalism, they willingly assist us in ensuring the safe and easy loading and dispatch of horses – even allowing our cargo to be last on at loading and first off at its destination. Wherever your horse is going, whether by air, land or sea, with CHT it is in the safest of hands.